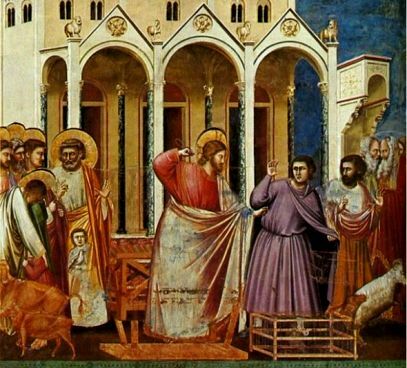 There was an angry confrontation between Jesus and the money-changers and guards in the great Temple of Jerusalem. 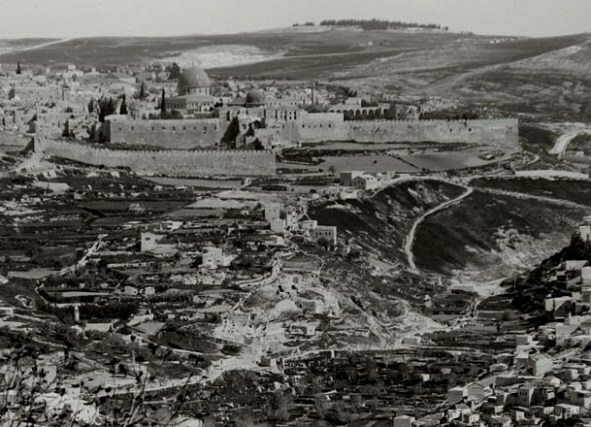 Jesus said they had turned the sacred place into a den of robbers, and he evicted them. What was it like? 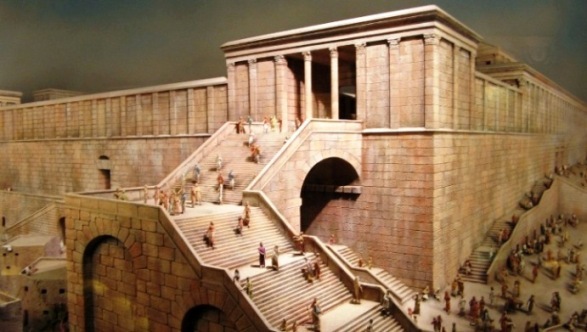 The first thing Jesus did when he got to Jerusalem was to go to the great Temple, newly built in shining white marble, and vast, about 450mx300m. Jesus probably offered sacrifice there and prayed. But what we hear about is the action that happened in the Court of the Gentiles. the Temple-appointed merchants/money changers probably cheated or over-charged people. 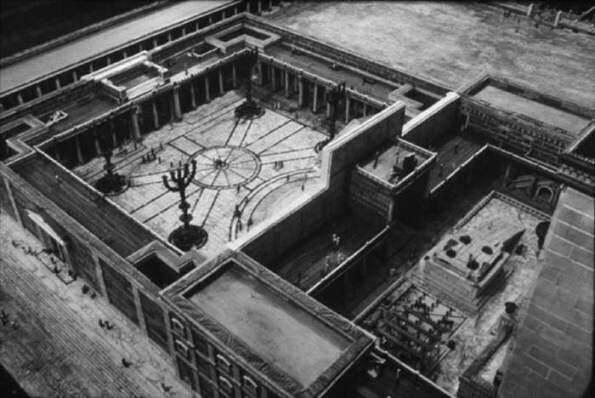 To add to the unholy din, tradespeople used the Court of the Gentiles as a short-cut between the city and the Mount of Olives – the Temple precincts could be entered from all four sides. All this was harmless enough, but it meant that the Court of the Gentiles was something less than a place of prayer. Jesus was not the only one to object: there was widespread criticism of the 1st-century Temple scene among Jewish writers. 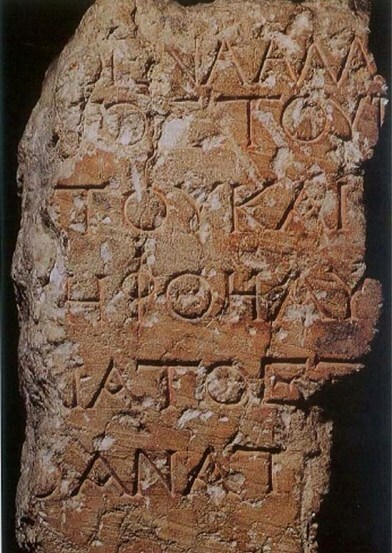 At right is an excavated stone sign found at the site of the Temple of Jerusalem. 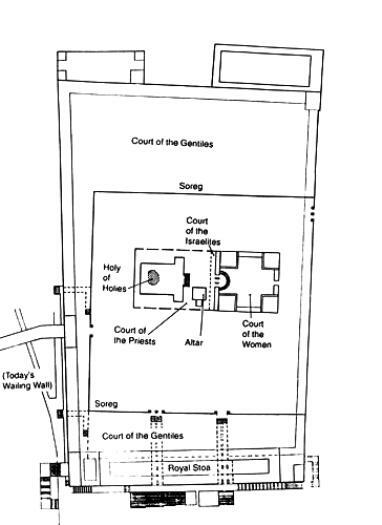 It advises that Gentiles must not enter past this point, on pain of death, and was presumably at the entrance separating the Court of the Women from the Court of the Gentiles (see ground plan below). What sort of people were there on that day? When did it happen? John puts this event at the beginning of Jesus’ ministry, and the other three evangelists place it right at the end, just before Jesus was killed. Who is correct? And does it matter? It is quite possible that Jesus cleansed the Temple twice. We know he went there a number of times. Several years may separate the two cleansings – to judge by Jesus’ anger in Matthew, the first incident had not been effective, which is why Jesus was so angry. But we also know John tried to supplement the other gospels, and this may account for the differences. John may have deliberately used a different narrative structure, one that did not rely on historical sequence. The message may have been more important to him than the order in which events happened. The incident took place in a very large area – so large that many people would have been unaware of what was happening. Thousands of pilgrims were crowded into the courtyard, together with the tables of the money changers and stalls to keep the sacrificial animals. There were Temple police who kept order; a large number of them would have been present at this major festival. Had there been a large-scale fracas, these police would certainly have acted. So Jesus could only have attacked some of the money-changers’ tables. it gave Jesus’ enemies, the high clergy and the aristocracy of Jerusalem, the chance to bring a grave and specific charge against him. There was already a conflict going on between the Sanhedrin and the High Priest Caiaphas in AD30, when Caiaphas allowed traders to set up markets in the Court of the Gentiles as punitive competition against markets controlled by the Sanhedrin. What Jesus said: why was he so angry? For this part of the story, see the red text in the Gospel passages at the bottom of this page. What Jesus said at the time is as important as what he did. 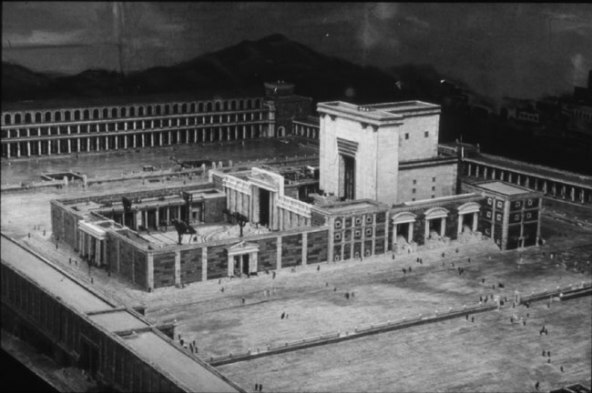 He was objecting to trade being carried out in the Temple not because of profiteering, but because the Temple precincts have been turned into a place of business, thus violating its divinely intended purpose. He bases this on the words of the prophet Isaiah ‘my house shall be called a place of prayer’. Now it is a ‘den of thieves’- again, a phrase from another prophet, Jeremiah 7:11. To emphasise this point, all of the gospel writers include Old Testament prophecies in their description of the event. Jesus’ references to Isaiah and Jeremiah would have been provocative and offensive to the priests, since he was using the words of Scripture against them. Only the presence of so many supportive pilgrims stopped them from taking immediate and public action against him. The priests showed their piety by saying that Jesus should have been shocked by the sing-song words of the children calling him ‘Son of David’, and should have stopped them. But the children had spoken the truth, and Jesus accepted the title. For this part of the story, see the black text in Gospel passages at the end of this page. he was not only popular, he was very much in view when he visited the Temple precincts. There was a crowd around him all the time, and any attempt at arrest could cause a riot. every evening during his last visit to Jerusalem, Jesus went out of the city as darkness fell – possibly to the house of Mary, Martha and Lazarus in Bethany. This made it difficult to arrest him. Perhaps he felt unsafe in the city. But there may have been a more prosaic reason for his departure each evening: Jesus, along with the thousands of other Passover pilgrims, would find it hard to find lodgings for himself and his followers – or perhaps this large group could not afford high-priced accommodation. Jesus mounted a protest against the commercial activity going on in the Temple. The money-changing and selling of sacrificial animals interfered with the proper use of this most sacred of spaces, and Jesus was outraged at a sacrilegious use of this place of prayer. He took sudden, dramatic action. It was not the animal vendors and money-changers he criticised as much as the Temple establishment who allowed it. The ruling priests, especially the high priest himself, gave permission for these commercial activities to take place. They were ultimately responsible for this desecration of a holy place. 18 And the chief priests and the scribes heard it and sought a way to destroy him; for they feared him, because all the multitude was astonished at his teaching. 19 And when evening came they went out of the city. and drove out all who sold and bought in the temple, and he overturned the tables of the money-changers and the seats of those who sold pigeons. 46 And he was teaching daily in the temple. 47 The chief priests and the scribes and the principal men of the people sought to destroy him 48 but they did not find anything they could do, for all the people hung upon his words. 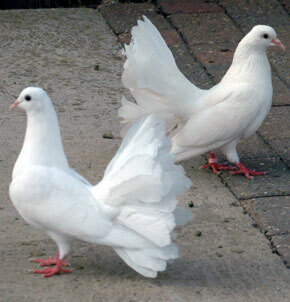 14 In the temple he found those who were selling oxen and sheep and pigeons, and the money-changers at their business. 15 And making a whip of cords, he drove them all, with the sheep and oxen, out of the temple; and he poured out the coins of the money-changers and overturned their tables.